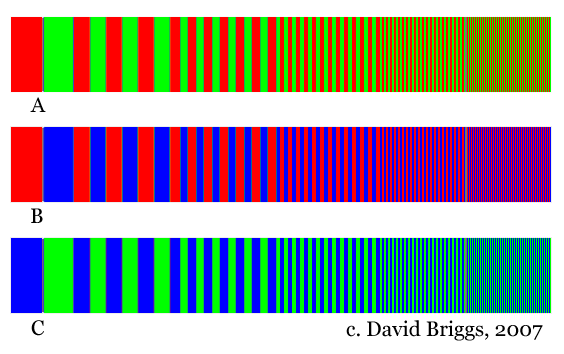 It’s not difficult to see that while the colors on the left are distinct, those smaller, tightly spaced stripes on the right begin to mix together. It’s our eye that does that. So what does this mean for residential interior design? Well, we all have to think like Monet. Or Seurat, actually. Their paintings were meant to be viewed from a distance – too close, and everything is a bit too distinct. Here, optical mixing is what creates the intended forms and color – as opposed to muddying it, which the above diagram might imply. Optical mixing can be manipulated in our favor, or work against us! One example of an unintended consequence of optical mixing is a beautiful rug I encountered the other day at a local carpeting store. So what color is this rug? This is how people usually look at materials – way up close and personal. We really study things, don’t we? 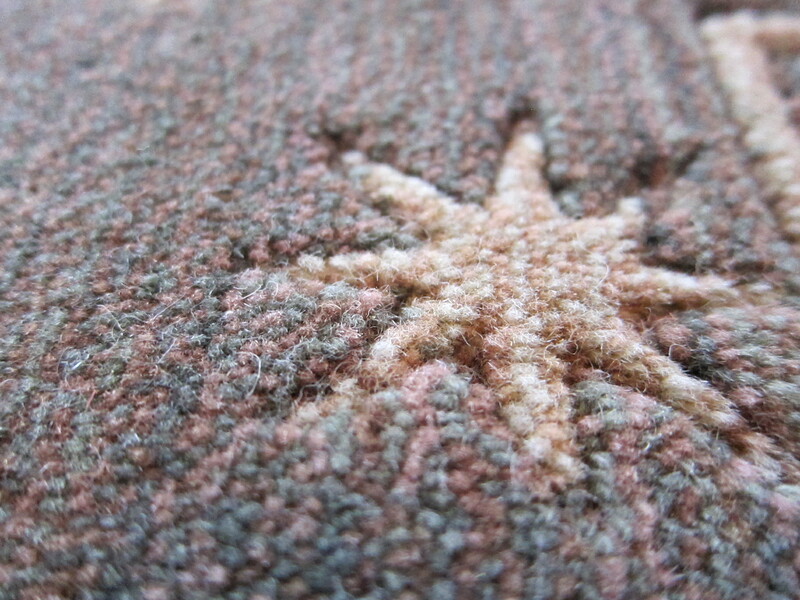 At this distance, I would say this rug is a muted green and a reddish-beige color. What a lovely combination! Argh! What happened to our red and green rug? The pile yarns have mixed into a grayish hue we didn’t see before. Textbook optical mixing. You see, when you mix the complementary colors of red and green, you get something called a ‘theoretical gray’ – it’s not a gray in the truest sense, but a more brownish, earthy color. This is where earth tones come from, actually. 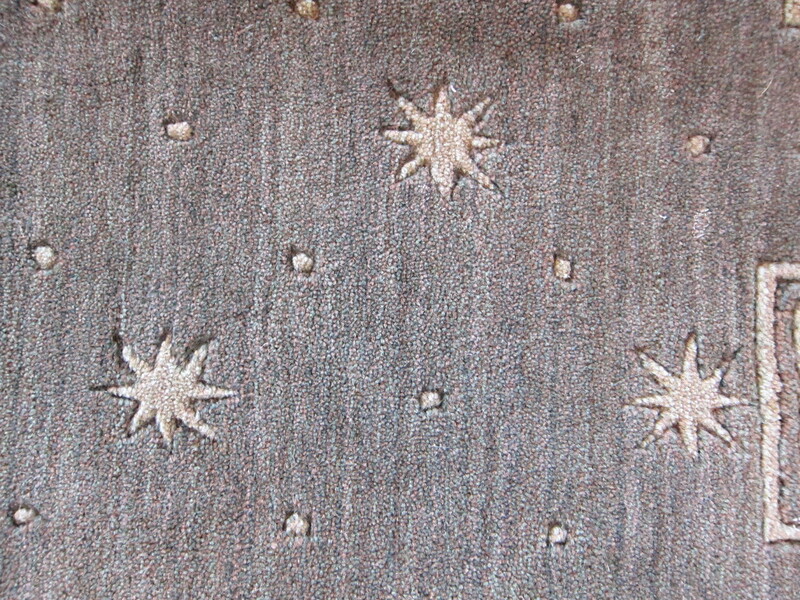 The effect in the case of this rug is totally intentional. But if we don’t know the effects of color, we could have made a very unfortunate and expensive mistake. 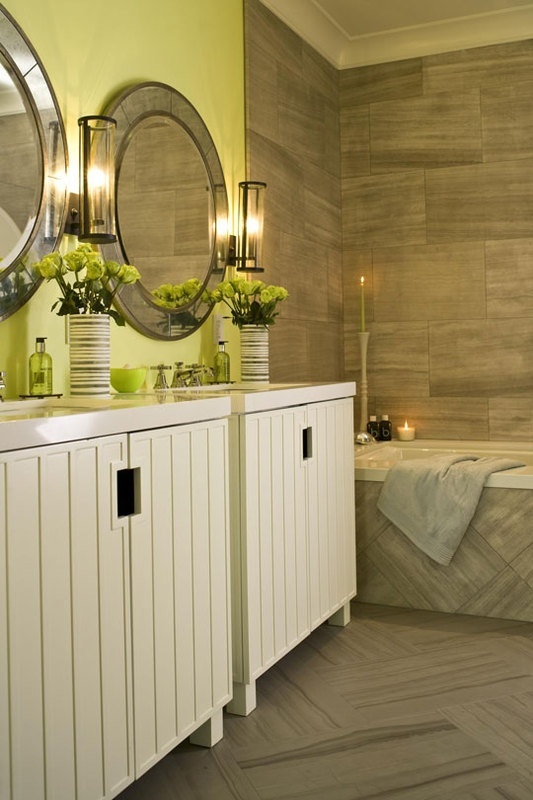 I hear a lot of color consultants talking about ‘pulling a color’ out of some other material in a space to use as a color for the walls – usually, tile or countertops. This can definitely work, but in the case of a smaller scale pattern, that color might not even be visible at a normal viewing distance, creating a discordant color design. Noted blogger and color expert Maria Killam pinned this picture earlier today as an illustration of conflicting undertones in beige materials. It also happens to illustrate optical mixing quite well. It wouldn’t surprise me at all if that wall color was ‘pulled’ from the shower tile, or at least is close to a color in the tile. However, from a normal viewing distance, the tile looks gray and mucky – largely because of the clear lemon-lime paint color on the walls. There is no relationship between these colors, so it makes them each stand out like a sore thumb and just look ‘wrong’ to both the trained and untrained eye. Other places to be especially aware of optical mixing are in small scale patterns of fabric and wallpaper (which often end up looking like textures, or even solids, depending on the pattern). When you look at your materials, be mindful of the distance(s) from which you will see them. Put flooring materials on the floor and stand up and look at them. Place countertop samples at waist level and look down at them from various angles. View backsplash tile a few feet away (and more), and place it vertically. Just to be clear – optical mixing isn’t a bad thing. It’s just a phenomena to be aware of, to help prevent costly mistakes in your own home (and possibly with your wardrobe, too!). Next articleColorWho's Afraid of Pink Beige?